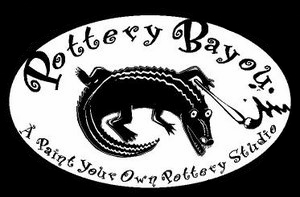 Pottery Bayou is the perfect choice when looking for a party option for your child! You bring the guests, treats, and decorations, and we'll provide the unique experience of creating something special and memorable—and we'll do the clean up, too! When your childs' party guests number six or more, you have several creative options from which to choose. They may paint pottery together, or, if over the age of 7, they may want to work with fused glass or wet clay. Once you decide which medium is appropriate for your child's party, just give us a call and reserve our Party Room, which seats 18 people comfortably. On the day of the party you are welcome to bring food and drinks, balloons, decorations, and of course, cake—to add to the festivities. For kids' groups of less than 6 painters, the group may choose from our bisque selection on our main floor. To the price of the bisque you'll add their studio fee of $5, for kids ages 12 and under, $8 for kids over the age of 12. Painters may choose to paint one of the following pieces: dessert plate, mug, airplane figurine, owl figurine, cupcake bank or lady bug. Painters may choose one of the following pieces: salad plate, mug, cat figurine, bowl, Moon/Stars box or bank. Painters may select any single item valued at $20 or less from our huge inventory of bisque shapes. Note: Party package prices apply to parties held during our regular studio hours. After hours parties require a minimum of 10 painters and a $100 studio rental fee. ** Bisque options may vary. Check with us about what is available when making your reservation. Appropriate for kids ages 7 and up, you may select the project level for your child's party. Each will learn how to layer the glass to create fun designs. Beginning with a clear, 7" square base, each person will create a beautiful piece to hang in the window. Using the clear 7" square base, each person will create a functional piece that will be shaped into a plate or bowl. Appropriate for ages 7 and up, your guests will have fun creating a slab rolled project. $25 per person includes instructor for 1.5 hours, supplies, bisque firing, and return studio fee to complete the project. Examples of past projects are a hanging picture frame, owl wallhanging, and ABC letters of guests' names made into hanging art. * We recommend painters ages 2–5 be accompanied by an adult (other than the party host) who’s willing to provide one-to-one supervision. No piñatas, please.